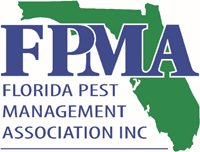 The Florida Pest Management Association is a state-wide organization with its main office located in Orlando, Florida. The Association was founded in 1945 in Gainesville, Florida as a non-profit trade association 501(c)6. For over 50 years, it has represented the industry and protected Floridians. The National Pest Management Association, a non-profit organization with more than 7,000 members from around the world, was established in 1933 to support the pest management industry's commitment to the protection of public health, food, and property. This commitment is reflected both in the continuing education of pest management professionals and the dissemination of timely information to homeowners and businesses.